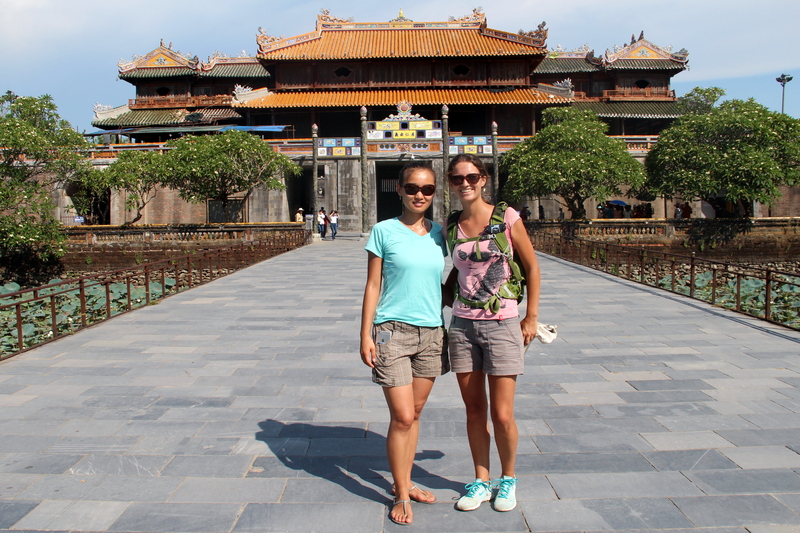 Hue was a positive surprise in our trip. I have to admit, I wasn’t familiar with the pre-war history of Vietnam and hadn’t heard of this city. But as I read more and more about the Nguyen dynasty, I started to get excited about visiting the 19th century imperial capital. We arrived mid-morning in a sleeper train from Ninh Binh/Tam Coc, and from the station took a metered taxi to a hotel we had booked the night before. I usually don’t discuss accommodations in this blog, because I don’t place much importance on them, but this one deserves a shout out. The Jade Hotel , for $10, provided a modern, large, clean room with AC, high pressure hot shower, order-as-much-as-you-want-from-menu breakfast, fresh juices and wet towels every time you walked in, and ever smiling staff. Our first day in Hue was the hottest of the whole trip, and by the time we checked in and ate “brunch”, it was grilling noon. So we decided to relax in our room for a couple hours, and organize the following days of traveling. The old city can be visited in 2-3 hours, and we were planning on going to the tombs on the Perfume River the next morning, so there was no rush. 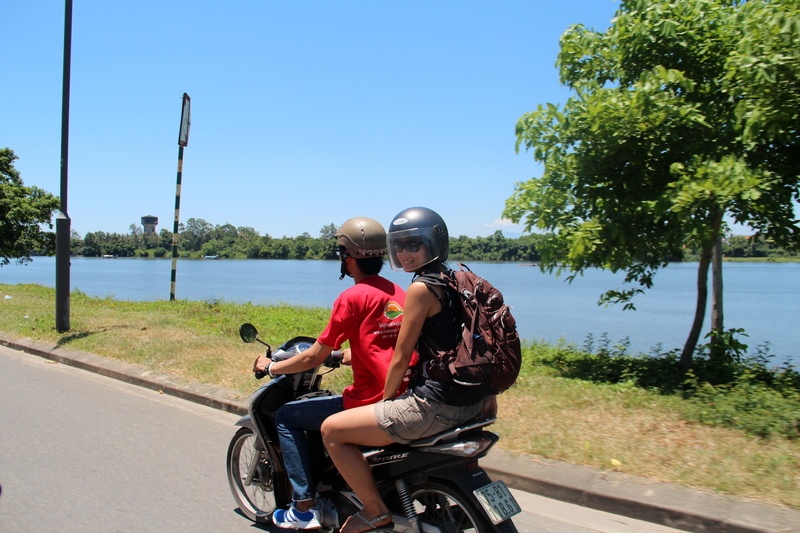 Eventually, we got out and crossed the Truong Tien Bridge to get to the citadel. 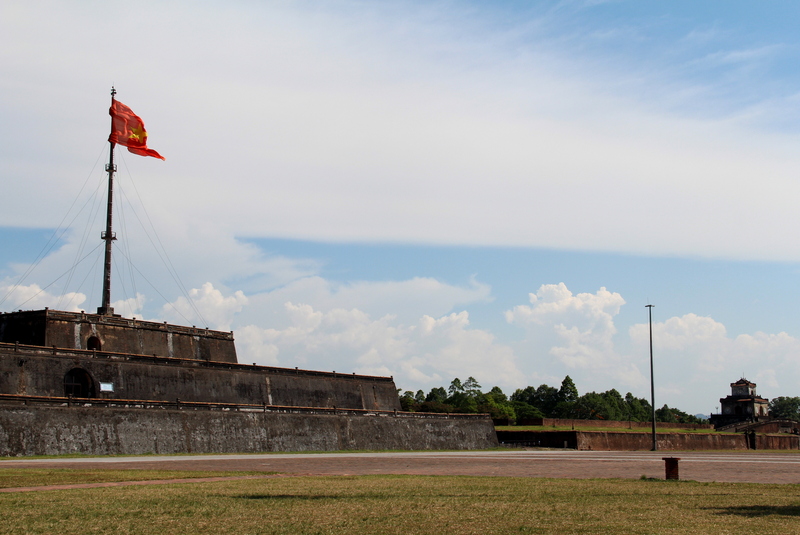 We entered through one of the fortified gates and walked by the thick walls to reach the central Flag Tower and the Nine Holy Canons, representing the four seasons and five elements (earth, water, fire, metal and wood). Right there, we got our entranced ticket for the Imperial Enclosure, a sort of citadel-within-the-citadel, which includes the Forbidden Purple City, a sort of citadel-within-the-citadel-within-the-citadel. The complex is huge, and the palaces, temples and gates are being restored to return this magnificent site to its splendor. We walked around for a couple hours, peaking into most of the pavilions and checking out the photography exhibits, imagining how the emperors lived until not so long ago. We exited the Imperial Enclosure to the north, and explored the interesting neighborhoods that have developed there, still inside the citadel… and we had our mandatory sugar cane drink 🙂 Walking back south toward the river, we checked out a local mall and the Dong Ba market, a typical hodge-podge of stalls selling food, clothes, and all sorts of things. To make time until dinner, we walked slowly on Le Loi Street, where dragon boats were offered to tourists, and through the backpackers district, where we booked a motorbike tour for the next morning, and bus tickets to Danang for the afternoon. Be aware that in Vietnam the bus ticket prices are all over the place, so you can save a lot of money by asking around and bargaining. 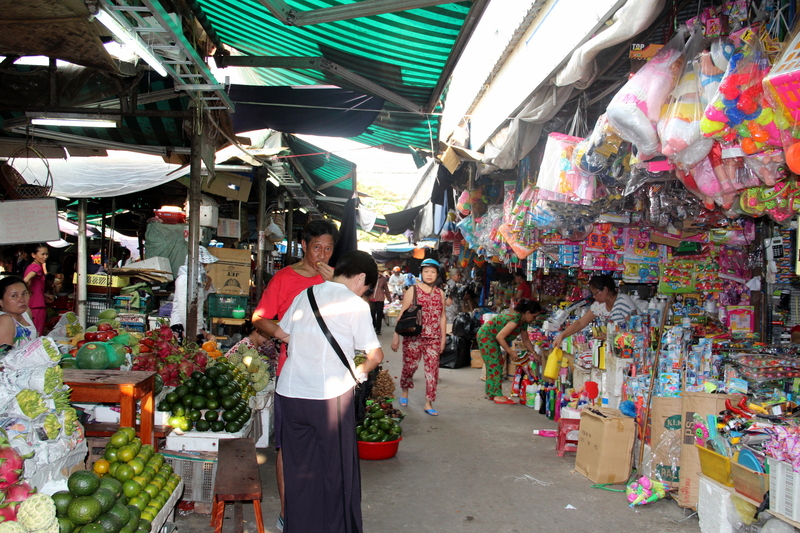 Once the sun was down, we made our way to the night market area between the Truong Tien and Phu Xuan bridges. This is a very new market, from 2012 I believe, and is a nice place to buy souvenirs and grab a bite among local tourists. 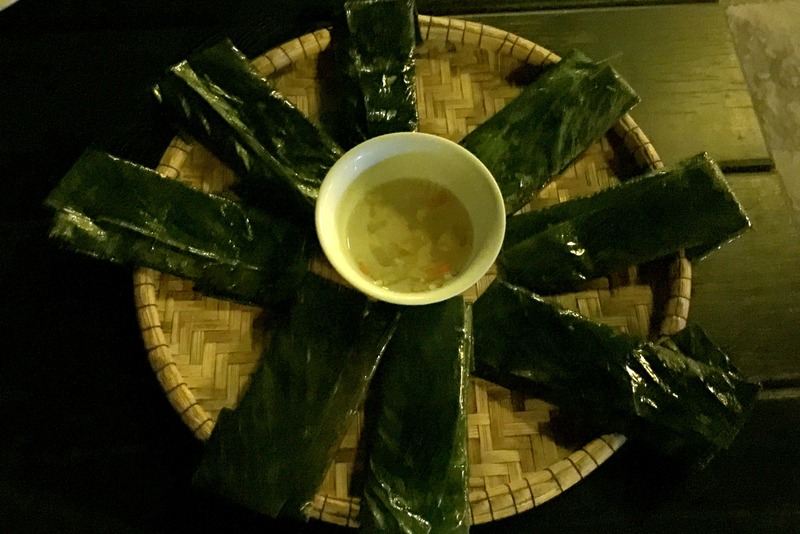 We sat down on the waterfront and enjoyed one of our best meals in all of Vietnam: Bun Bo (vermicelli and beef soup), caramelized shrimps and Banh Nam (steamed rice dumplings with shrimps and scallion, wrapped in banana leaves). To help with digestion, we took a walk on some sculpture park on the riverside, which was very animated with families and teenagers at night. The next morning we woke up very early for our motorbike tour of the Nguyen tombs, the highlight of Hue. Probably the easiest way to visit these sites is to hire a xe om (motorbike with driver), since technically you’re not allowed to drive yourself without a Vietnamese license. The price seemed to be the same whether you joined a tour or do it privately (~$12 per person, excluding entrance tickets), so we arranged for two drivers from Impressive Rider to pick us up before the tours start time, to avoid the crowds. 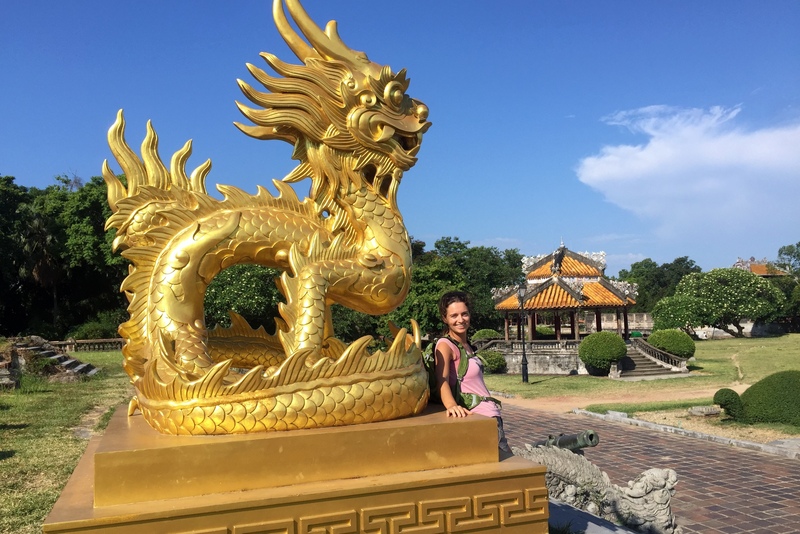 There are 7 imperial tombs on the bed of the Perfume River, but like most people, we chose to visit just 3, plus the Thien Mu Pagoda. Our first stop was the tomb of Khai Dinh, the most recent emperor, who was accused of being overly influenced by the French. 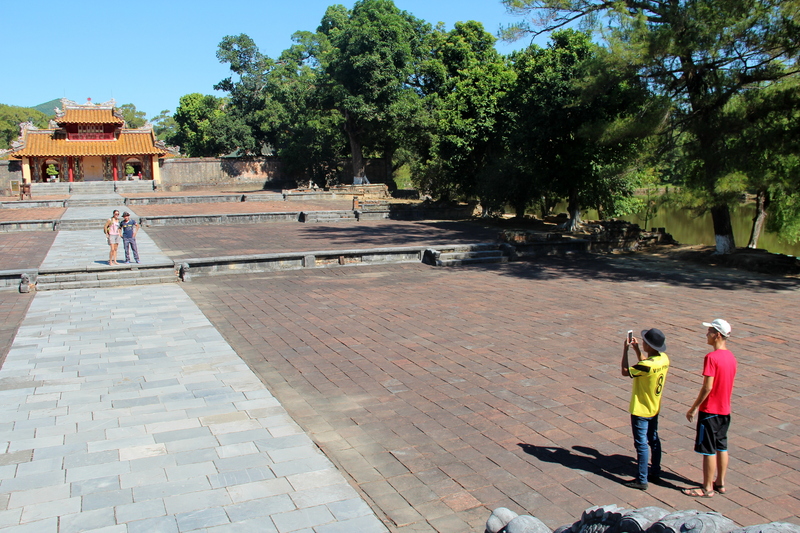 The structure was massive, mostly dark stone, and definitely felt like a mix of Vietnamese and European. 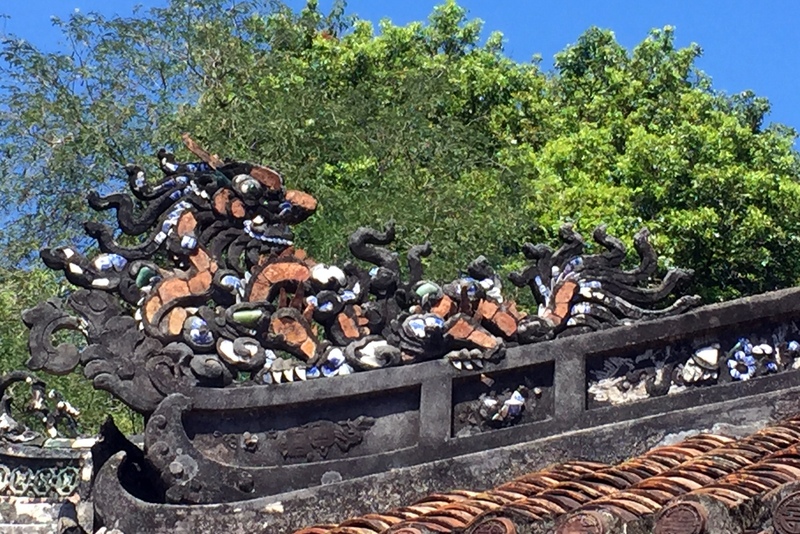 The coolest part was the rows of mandarin, horses and elephants statues on the first courtyard. 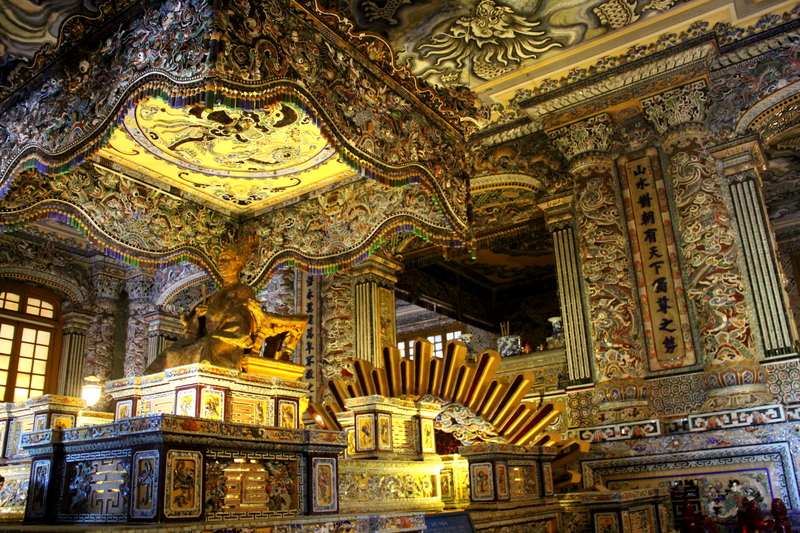 The intricate decoration of the main hall, where the emperor’s remains rest, was also admirable. 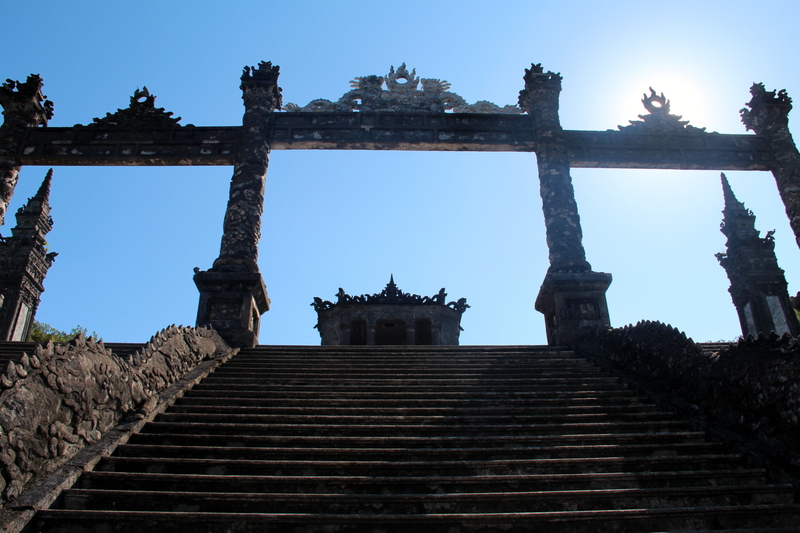 Our drivers took us then to the tomb of Minh Mang, the most impressive from an architectural point of view. Here, the style was 100% traditional Vietnamese, very similar to what we had seen in the citadel the previous day. The complex included several pavilions and temples, gardens and ponds, gates and staircases, all perfectly symmetric, and at the very end, a circular wall guarding the sepulcher. We walked around for a good half hour, taking in the harmony between architecture and nature. There was also time for a morale-boosting celebrity moment, when some local guys asked to take a picture with me. It brought back fond memories of Kakku, Myanmar. 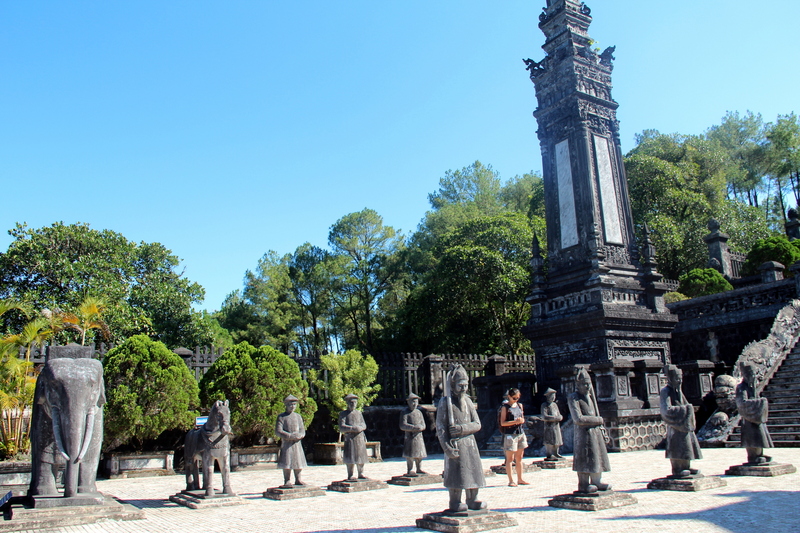 Then we visited the tomb of Tu Duc, which was being heavily restored. Perhaps for that reason, or because it was the third one, we enjoyed it less than the others. But it was still impressive, mainly because the emperor built it to spend time there during his life, as much as to be buried after his death. There were numerous halls containing his belongings, and even a lake with a little island and over the water pavilions, where he would hang out with his concubines. 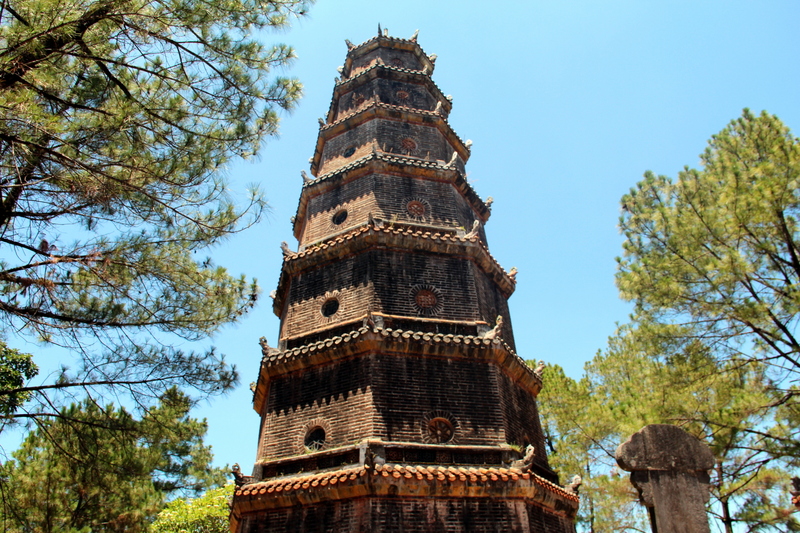 Our final stop was the Thien Mu Pagoda, an imposing octagonal tower perched over the river. The temple has seven stories, each dedicated to a form of Bhudda, and a large marble turtle on the side, symbolizing longevity. 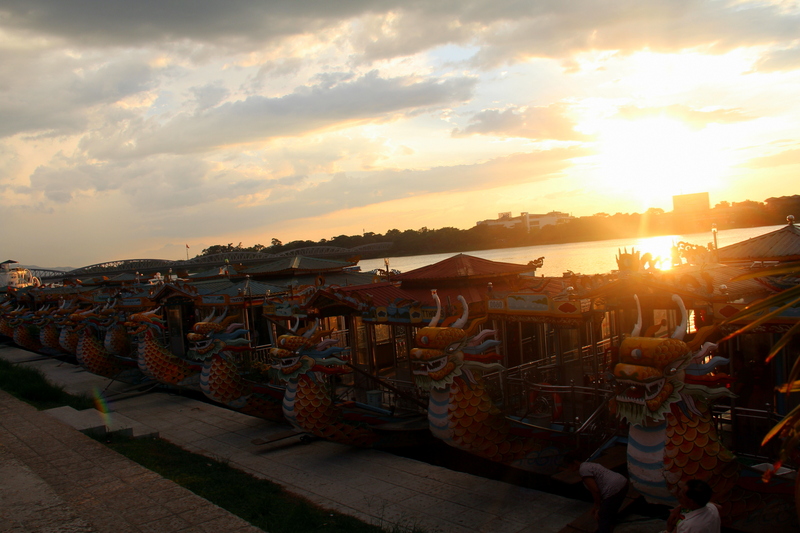 It was a perfect place to end our visit to Hue. The xe om experience had been great; our drivers were conscious about safety, very efficient and easy to converse with. After being dropped off in our hotel and before getting on the bus to Danang, there was one last thing we wanted to do: eat! 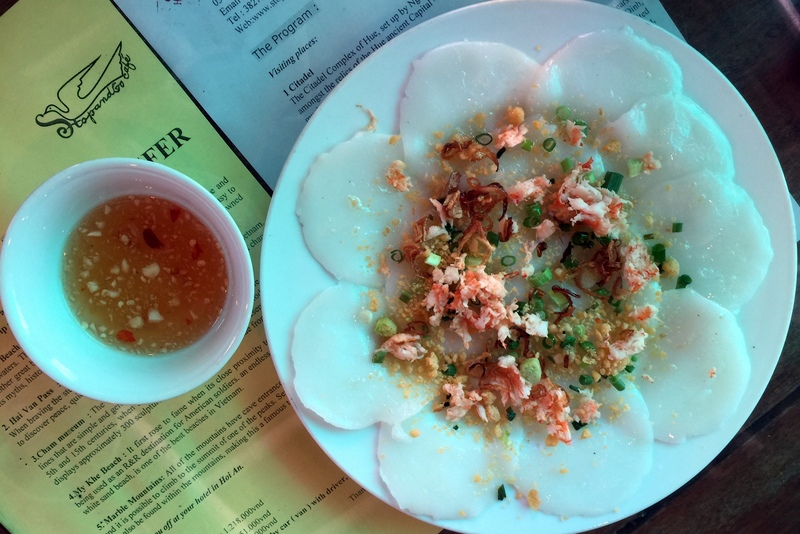 We had tried some of Hue’s most famous dishes the previous night, and snacked on Banh Khoai (fried crepe stuffed with bean sprouts, shrimps and pork belly) in the morning, but we still hadn’t tried Banh Beo. We found a small place nearby and savored the steamed rice cakes with shrimp, scallions and crispy fried shallots. Now we were ready to keep going.